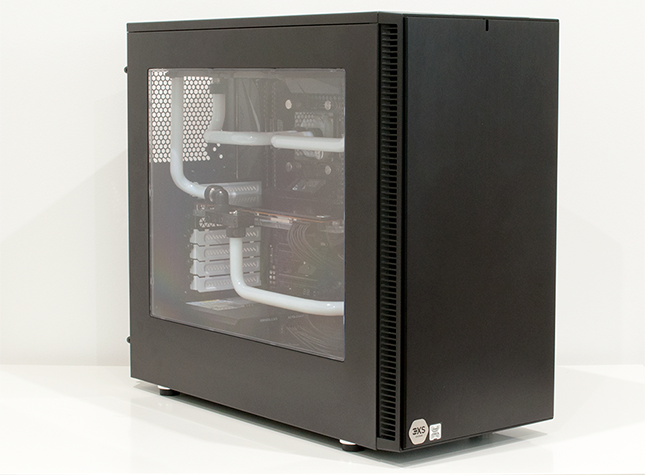 This is a great time to be in the market for a high-end desktop (HEDT) PC. Competition has been restored to enthusiast CPUs, and after years of relatively low-key releases, Intel has introduced the Core X Series, spearheaded, right now, by the 10-core Core i9-7900X, and AMD has fired its retort in the form of the 16-core Ryzen Threadripper 1950X. Heck, if that isn't enough to whet the appetite, Intel will soon be following up with an 18-core monster known as the Core i9-7980XE. Said chips are true heavyweights designed specifically for enthusiast gamers, content creators or prosumers who want a PC capable of handling every conceivable workloads. We've seen the benchmarks come to life in recent reviews, and now it's time for system integrators to showcase their interpretation of the perfect HEDT experience. Up first is UK-based Scan Computers, who has sent in the £4,000 3XS Carbon Fluid Xp for evaluation. This premium machine houses the latest and greatest high-end tech from Intel and Nvidia, yet at first glance doesn't have the eye-catching look and feel you might expect at this price point. Our discussions with Scan's engineers reveals that the team tried a few different chassis and struggled to find a solution that delivered the preferred blend of cooling potential and quiet operation. In the end, Scan settled on the Fractal Design Define S, a mid-range £80 chassis that gets most of the essentials right without pushing the boat out. The chosen case can be considered a safe option, and the fact that Scan struggled to find a more tantalising enclosure is a sign of limited innovation in the chassis market. Indeed, the system integrator had hoped to provide front-facing USB 3.1 Type-C, but mid-tower cases with said functionality are few and far between. The good news is that while the Define S chassis is somewhat underwhelming on a build of this ilk, the interior components and configuration are mighty impressive throughout. Intel's premier CPU, the Core i9-7900X, is at the helm atop an Asus RoG Strix X299-E Gaming motherboard and flanked by 32GB of Corsair Vengeance LPX DDR4-3200 memory in a quad-channel configuration. Intel's best CPU is joined by Nvidia's finest GPU, the Titan Xp, and given that both are susceptible to throttling with reference coolers, Scan has opted for liquid-cooling all round. The loop comprises two EK waterblocks, an EK D5 pump, one 360mm EK radiator in the front, one 240mm EK radiator in the roof and five Fractal Design Venturi fans. 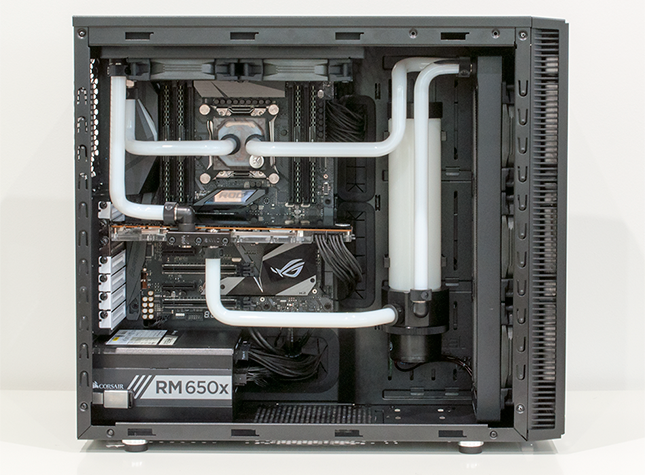 Acrylic tubing with Mayhems Ice White coolant provides a lovely contrast with the RGB motherboard and LED strips, and as the benchmarks will reveal in due course, both temperature and noise are kept to a minimum. This level of cooling suggests healthy overclocks on both fronts, and Scan doesn't disappoint. The Core i9 chip is set to 4.6GHz across all 10 cores using 1.225V, while Titan Xp sees boost clock climb from 1,582MHz to 1,732MHz and memory from 11.4Gbps to 12.4Gbps. Good to know, and the liquid loop works a treat - our logs reveal that the GPU maintained a cool 2,038MHz when gaming. Elsewhere, storage is provided by a 512GB Samsung 960 Pro M.2 SSD, with a 2TB Seagate Barracuda for secondary purposes, and power is sourced from a 650W Corsair RMX supply. 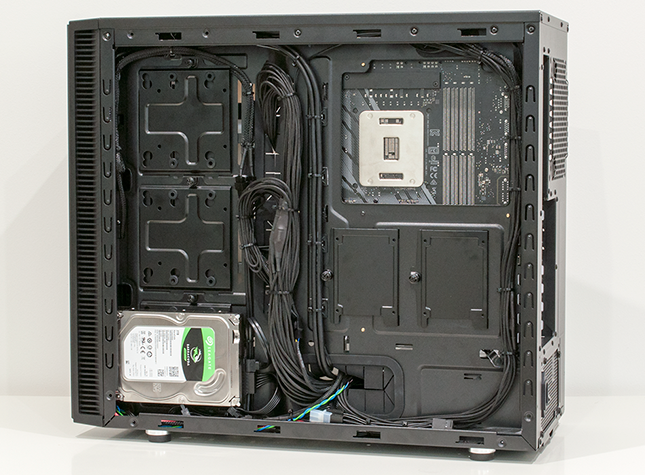 Scan uses individually sleeved cables that are easier on the eye, and cable management is decent throughout. What's clear to see is that Scan pays attention to the HEDT space by attempting to deliver a PC that customers will want. The system integrator tells us it opted against RGB memory because it wouldn't sync with Asus Aura, and it has also gone the extra yard to keep noise from being an issue. Having exhausted the default fan profiles, Scan resorted to custom fan curves that respond to an Aquacomputer temperature sensor sat inside the fluid, while the pump reacts to CPU heat. This is in keeping with our expectations of an ultra-high-end Core i9 machine, and though experienced users could build a similar configuration for a couple of hundred pounds less, Scan's standard three-year warranty brings extra peace of mind when overclocks are applied to such extreme hardware. There are, however, question marks surrounding the price tag. Now that AMD offers many more cores for no extra money, is Core i9-7900X still the best bet? That's open for debate, particularly with the 12-core Core i9-7920X arriving later this month, but if the premium attached to top-end parts isn't agreeing with your wallet, Scan has an intriguing secondary configuration dubbed the 3XS Carbon Fluid Ti. Said machine downgrades the CPU to a hexa-core Core i7-7800X and switches the GPU to GeForce GTX 1080 Ti, which is enough to shave a whopping £1,000 off the asking fee.